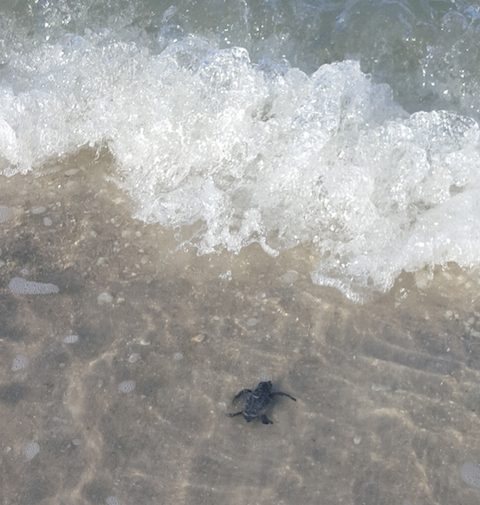 The last loggerhead sea turtle hatchling of 2015 emerged from the sands of Vanderbilt Beach on Thursday morning, October 8th. Scrambling to the Gulf and imprinting on Naples pristine white beach along the way, this tiny baby struggled through the surf zone to venture into the expansive waters of the Gulf of Mexico and the global ocean beyond. As though sensing the enormity of this challenge, our little hatchling surfaced, took a deep breath and surveyed the boundless horizon. In an instant, it disappeared into the unfathomable mystery of the Lost Years, hopefully defying nearly insurmountable odds to resurface as a healthy juvenile before the end of the decade. Once a quiet, undiscovered tropical paradise, Naples has transformed through the late 20th and early 21st century into an international vacation resort with quaint one story, seaside bungalows transformed into high rise condominium towers. Yet, sea turtles remain undeterred in returning to their natal beach to dig nests and deposit eggs promising the next generation of marine leviathans. 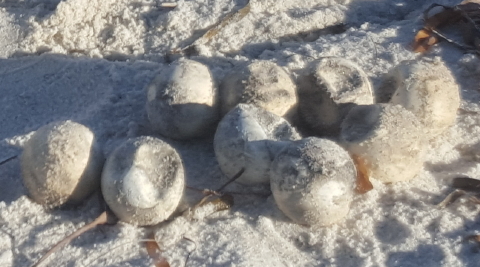 Sea turtle patrols organized by Collier County scour Vanderbilt Beach through spring and summer in search of tracks as mommas crawl ashore dragging hundreds of pounds across the sand to a nesting spot above the high tide line. 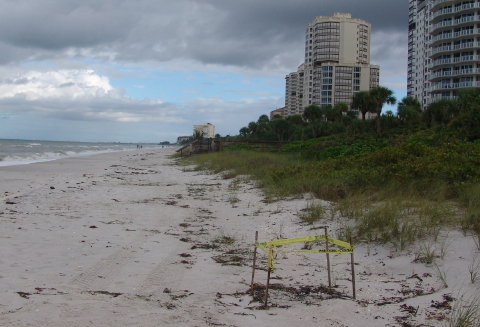 Nest #191, pictured above, proved the last of the season on Vanderbilt Beach. Once a nest is located, the sea turtle patrol cordons off the site and covers it with a large gauge wire mesh to discourage predators, but to allow the hatchlings to emerge after incubation. With heavy rain and storms, this season has proven challenging for Vanderbilt Beach nests. Many have succumbed to flooding that completely washed out nest and eggs. Others have shown reduced productivity with undeveloped eggs, drowned hatchlings and unpipped hatchlings still inside their eggs. Nest #191 became one of the latter. 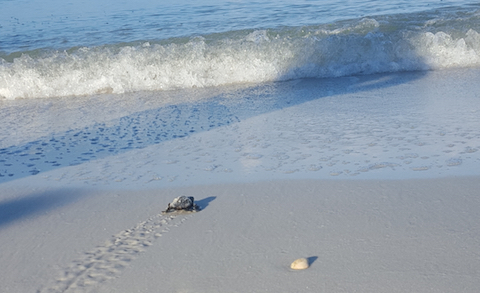 Later in the morning, Markus returned to Nest #191 with fellow sea turtle patroller Mary to excavate the nest. 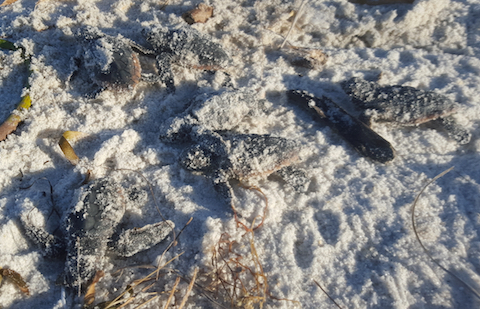 Marcus carefully dug up the nest while Mary jotted down findings and released live hatchlings as they were uncovered. Turtle Journal’s Don Lewis and Sue Wieber Nourse documented the excavation and the release. Nine live hatchlings remained in the escape tunnel, working their way to the surface, six of whom are imaged above. 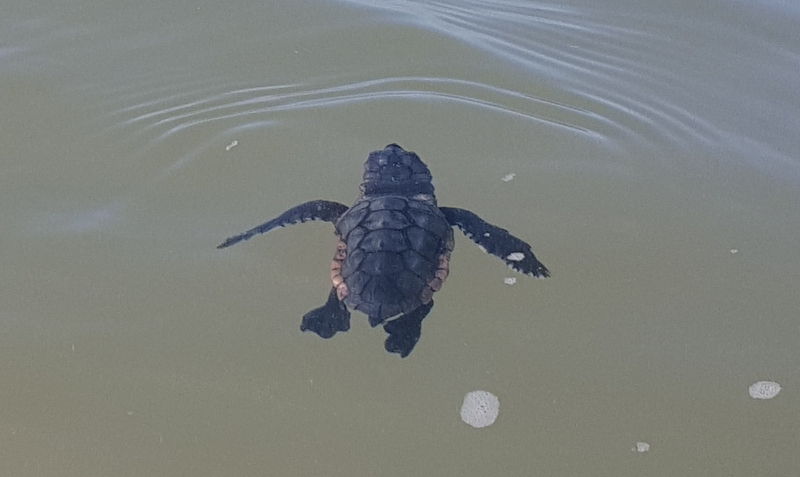 While we didn’t get an opportunity to measure and weigh these loggerhead hatchlings, they appeared substantially smaller and lighter than average, perhaps due to their late emergence or perhaps as a result of flooding and overwash. 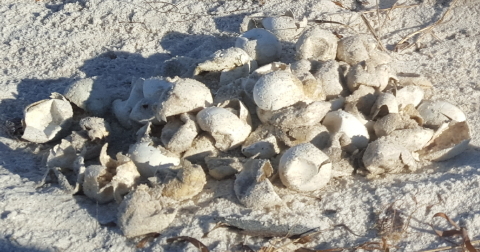 The pile of eggs shards told the tale of how many loggerhead sea turtle hatchlings had fully developed and had pipped from this clutch. While it was challenging for us to following Marcus’ counting in German, we noted more than 40 eggs shards representing more than 40 hatchlings. Unfortunately, nearly half had died inside the nest after pipping, most likely from drowning. 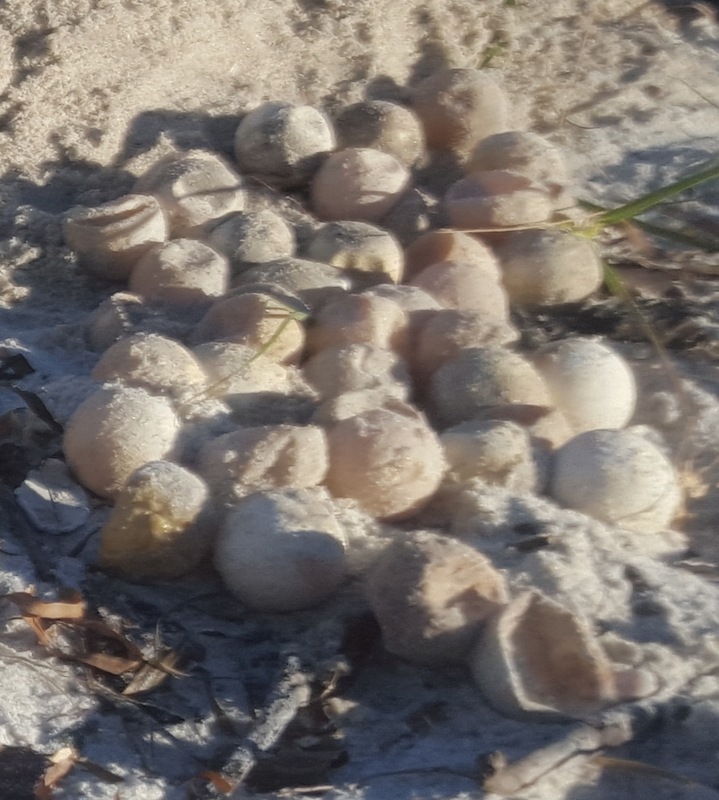 Nine of the eggs contained developing hatchling that had not yet pipped. Their growth had been arrested, perhaps by flooding, and these unborn babies had enormous yolk sacs with umbilici still attached. Nest #191 contained ~ 35 eggs that had not developed at all. 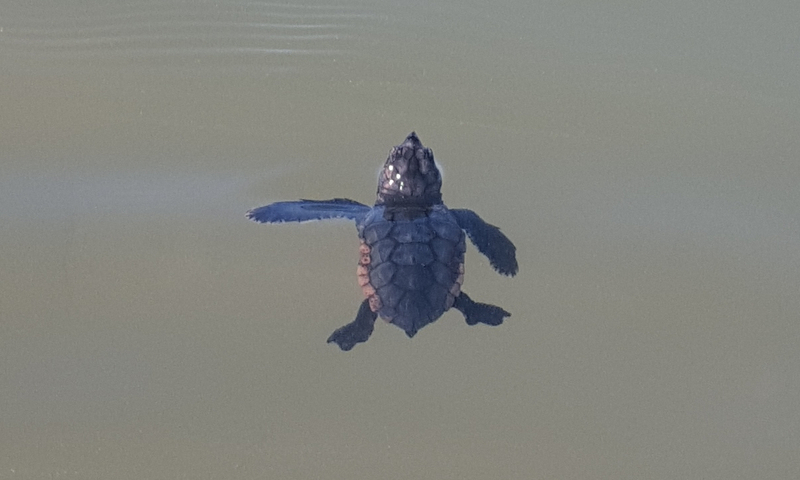 Following the Turtle Journal mantra: “There’s always one more!”, Sue Wieber Nourse spotted a hatchling in the neck of the nest that had burrowed itself so that Marcus couldn’t see it. 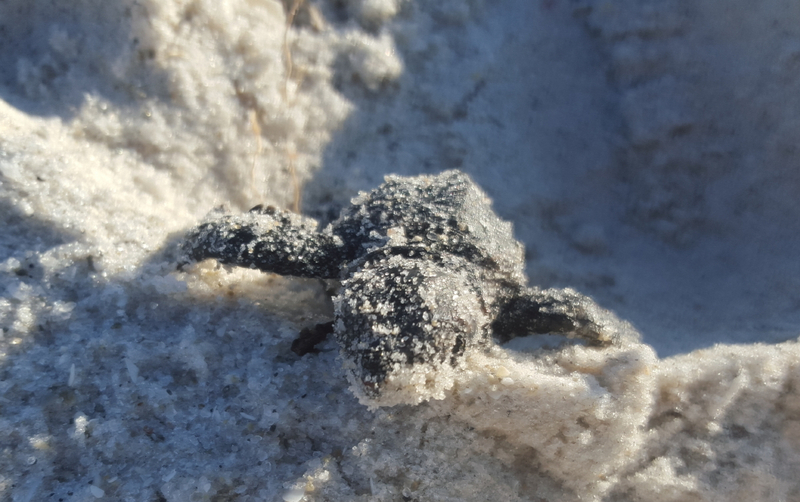 And so this hatchling had the privilege of being the last hatchling from the last 2015 nest on Vanderbilt Beach. 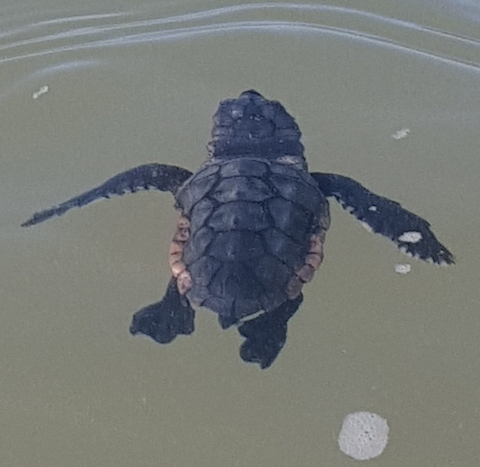 Sue watched and documented its progress as it scrambled from the nest to the water, imprinting its natal location, and beginning a most daunting life and death ocean adventure. The tiny hatchling plunged into the shallow water and like an Energizer bunny, wiggled and powered its way through the pounding surf zone. 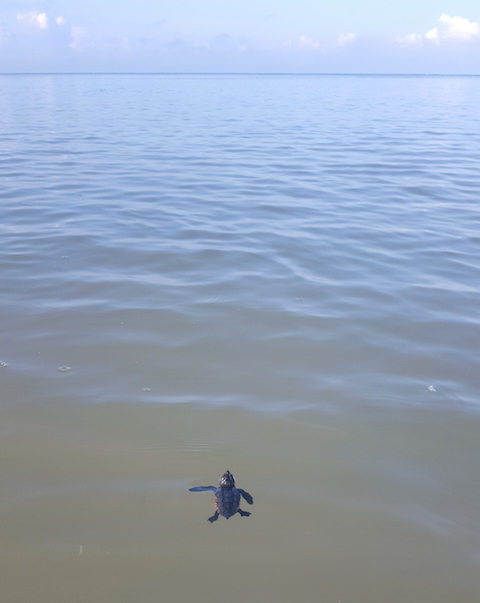 In calmer water across the surf zone, the hatchling paused, seeming to reflect and to gather its strength for the journey ahead. 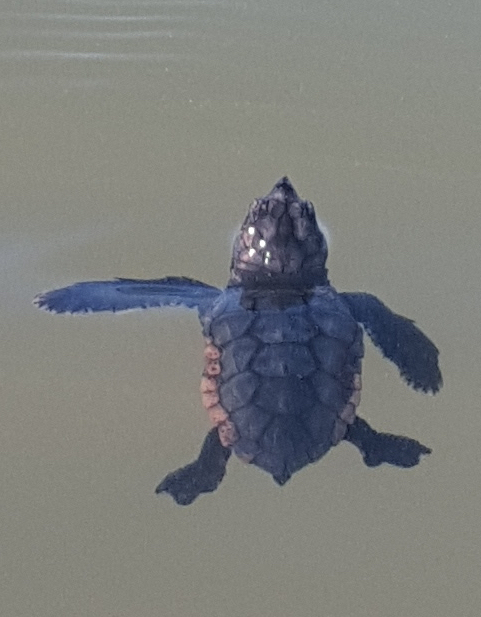 The last loggerhead hatchling surfaced and gulped a big breath of air. 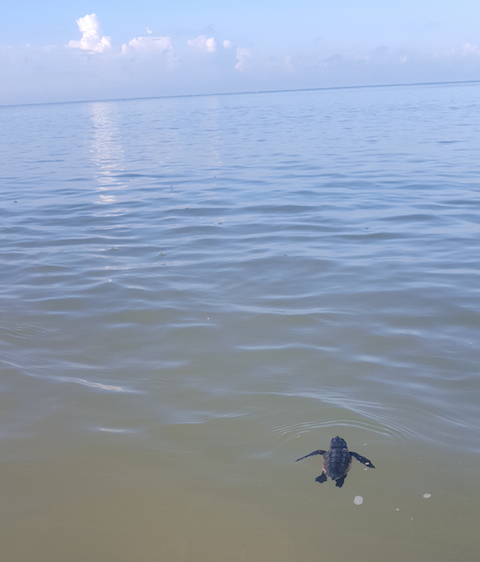 It surveyed the boundless horizon of the Gulf of Mexico, kicked its feet and paddled its flippers as it disappeared into the oceans beyond. After leaving the beach, sea turtle hatchlings vanish for the next few years, known by turtle researchers as the Lost Years. Except on rare, unpredictable instances, we don’t see them until they reappear as fairly good sized juveniles. Some researchers say that the odds of survival for a sea turtle hatchling are one in a thousand. When measuring the infinitesimal tininess of these creatures with comparatively infinite size of the world’s oceans, we can begin to appreciate the challenge they face. Watching the last hatchling confront these odds on an October morning in tropical Southwest Florida, the Turtle Journal team renewed our respect for these magnificent critters and celebrated the privilege we have been granted to witness such extraordinary stories. The Turtle Journal mantra never fails. There IS always one more. On the early morning of October 12th, Sue Wieber Nourse walked Vanderbilt Beach from the Ritz Carlton southward. As she approached Nest #191 that had been fully excavated on October 8th, she stopped abruptly. It couldn’t be, but it was. 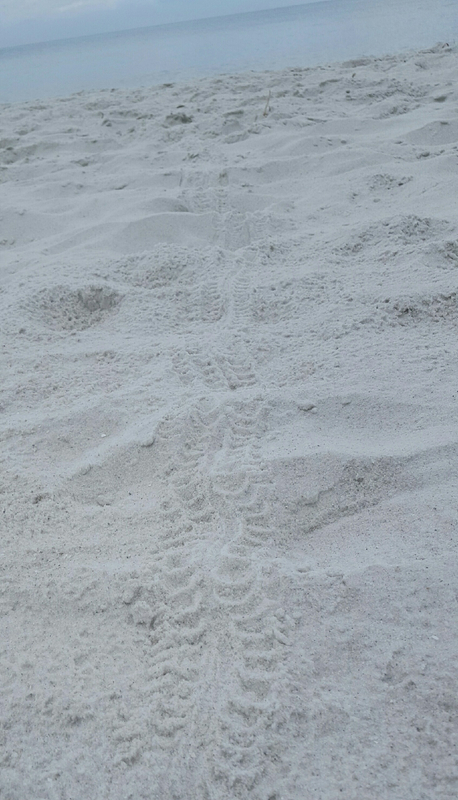 A single hatchling track emerged from the site of Nest #191 and made a beeline for the Gulf of Mexico. When the excavation concluded on October 8th, Markus had replaced all the dead hatchlings, shards, partially pipped eggs and undeveloped eggs back into the nest and reburied it. 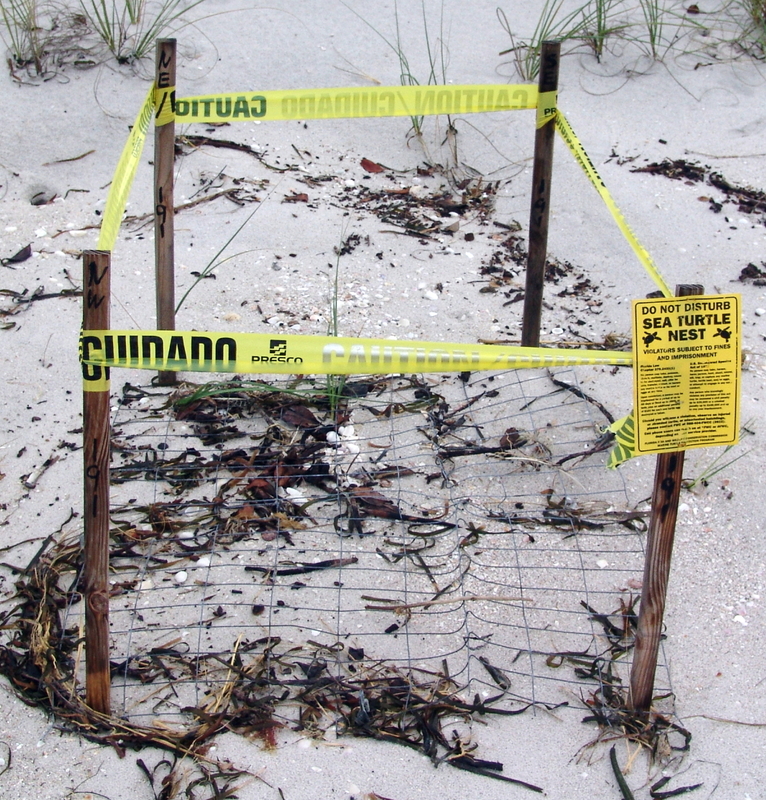 Predators, first ghost crabs and later mammals, had discovered the cache and continued to revisit the site each night. Somehow, one hatchling had been missed during excavation, or a presumably dead hatchling wasn’t, or one of the undeveloped eggs wasn’t so undeveloped after all. Whatever the source, one more live loggerhead sea turtle had evaded hosts of predators and emerged from Nest #191 overnight, had scrambled down to the water, and had disappeared into the Gulf of Mexico. There’s always one more and that’s what makes life so amazing and so interesting! This entry was posted on Tuesday, October 20th, 2015 at 2:45 pm	and is filed under Turtles. You can follow any responses to this entry through the RSS 2.0 feed. Both comments and pings are currently closed.